Dr. Mockler grew up outside Philadelphia, Pennsylvania. She attended Bucknell University in Lewisburg, PA, receiving her Bachelor of Science degree in Biology in 1985. She then worked for one year in the biochemical research field while applying to veterinary school. Upon graduation from the University of Pennsylvania School of Veterinary Medicine in 1990, she went on to complete an internship in small animal medicine and surgery at Oradell Animal Hospital, a 26 doctor veterinary referral hospital in New Jersey. After an additional year working in a small animal practice in New York she relocated to the New England area with her husband. Dr. Mockler then greatly enjoyed eight years practicing emergency medicine and surgery at Animal Emergency Care in Acton, and working as a relief veterinarian at many of the local veterinary practices. In 2001, she opened Middlesex Veterinary Center and is very happy to be settled into her own practice. Dr. Mockler is an active member of AVMA (American Veterinary Medical Association) and MVMA (Massachusetts Veterinary Medical Association). 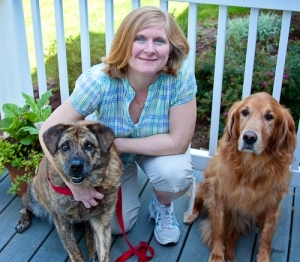 Dr. Mockler lives in Westford with her husband and three kids; their dog Tucker, a lab mix; and cat, Charlie. Dr. Mockler values her family time and is active coaching her kids in various sporting endeavors. In her free time, she enjoys sports of all kinds, skiing, traveling and reading. Dr. Roe grew up in Boxborough, MA, and attended the University of Vermont, graduating with a degree in Animal Sciences (pre-veterinary concentration) in 2002. She went on to Ross University, School of Veterinary Medicine, on St.Kitts in the West Indies, spending her last clinical rotation year at Auburn University in Auburn, AL, and graduating from Ross in 2006. Her first position as an Associate Veterinarian was at a mixed animal practice on the South Shore of Massachusetts; she then worked at a small animal practice in the Metrowest area for seven and a half years, before joining Middlesex Veterinary Center in January, 2016. Dr. Roe's professional interests include soft tissue surgery, dentistry, internal medicine and preventive medicine. She is a member of the AVMA (American Veterinary Medical Association) and MVMA (Massachusetts Veterinary Medical Association). Dr. Roe lives in Westford with her husband, young son, and 3-legged dog named Layla- who runs like the wind. She enjoys gardening, running, swimming (all of which Layla participates in), as well as spending time with family vacationing in Maine and Cape Cod.